Acoustical Pipe Wrap is typically used to wrap noisy pipes and ducts to block the noise that transmits through the walls of the pipe or duct as air or other contents move through it. The quilted fiberglass decoupler improves the performance of the noise barrier as well as to provide sound absorption and thermal insulation around the pipe or ductwork. The reinforced foil facing on the barrier readily accepts Reinforced Foil Tape for easy installation and also serves as a protective jacket for indoor or outdoor applications. 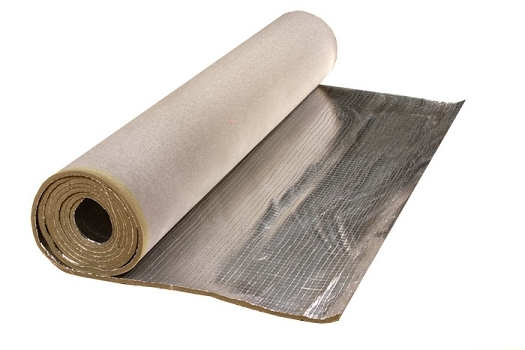 Available by the linear foot, our acoustical pipe wrap is rolled 48 inches wide by 1 inch thick and 30 feet in length. Our pipe wrap weighs in at a total weight of 1.22 lbs per square foot and has an STC rating of 29.